Not sure yet - we might release a 1.3 version before 2. Is there any way to load shapefiles without ever contacting the remote rest service? This _is_ not connecting to the remote rest service. Do you have any idea if it is possible to load a dwg file in a simalar fashion? This has tons of value for us! Thank you for posting the idea, description and source code! Thanks - we'll deploy it on a site and give it a test. Thanks for the source code. I loaded it in Flash Builder 4 and I got an error message about missing the agslib-SNAPSHOT.swc file in the Referenced Libraries. How can we label based on an attribute within the dbf? Hi Mansoor, Thanks for the awesome application. 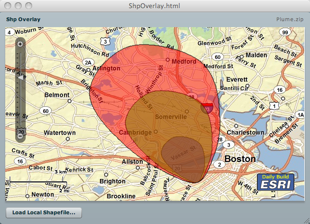 If I need to write the app so that it allows users to add shapefile of any spatial refrence. Do I need to first project the polygons to match the SR of the base map viewer and then add the projected graphics? Thanks in advance for your help. U r welcome - what projection do u wanna go to ? Hi Mansoor, Our app needs to let the user overlay shapefile on top of base maps (arcgis online street-wgs84). So am thinking since I don't have control on the SR of the shapefile that the user overlays using this tool, should I first reproject it to wgs 84 in my app using geometry service and then add the projected graphic? Could you suggest some way please ? Thank you in advance..
hai Mansour Raad this is RAMPRASAD from india tamilnadu very recently i saw your video FLEX API session in ESRI video library,it was really amazing. Glad that u like the app - all the source code (a bit old) all available for you to download at the bottom of the page - in addition, check out http://resources.arcgis.com/en/communities/flex-api/ for in depth information. I'm implementing a load shape file as a tool on my flex app, but I'd like to know in which API is possible to take the attributes from *.lyr file. I'm using API 1.3 and know it works fine... just the chiefs asked me about it. Have not done such an implementation - sorry.